Sherman, Redding, Bridgewater, and Bethel. Did you know that we also provide chandelier cleaning services? See our full list of services below! 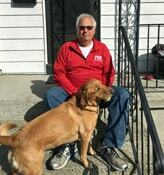 Bob Tilzer has been a Danbury resident since 1992. He owns and operates the Fish Window Cleaning office located in Danbury, CT, providing both residential and commercial window cleaning services. We are low rise specialists, focusing on homes and buildings that are three and four stories high but we can go higher; we clean taller buildings with the use of "lifts", "booms", and scaffolding. Been there, done it. You will see our cleaners, vehicles, and signs everywhere! Our customers are on Main Street in Danbury, on Danbury Road in New Milford and Danbury Road in Ridgefield. You can find us cleaning in the Danbury Fair Mall, the North Street Shopping Center, Dolan Plaza, New Milford Shopping Plaza, Copps Hill Plaza, the Galleria Mall in Poughkeepsie, and the Jefferson Valley Mall in Yorktown Heights. We provide services to hotels, office buildings, and supermarkets throughout our territory. Our residential customers are found throughout the area - in town house condominiums; colonial style homes in private communities; contemporary homes on Candelwood Lake, Lake Lillinonah, and Lake Zoar; and secluded A-frames nestled in the woods. From our office in Danbury we go South to Wilton and Weston, East towards Southbury and Watertown, going West to Poughkeepsie and Fishkill, or North to Kent, Washington, Litchfield and Thomaston. It’s simple; just call us or complete the online window cleaning estimate request form at the bottom of our website and we will come out to your home to provide you with a free estimate! National Reputation: In addition to being locally owned, we know that when we enter your home or business, we are representing over 200 franchisees across the county; only our best will do! Professional Window Cleaners: In addition to several interviews and a background check, all FISH window cleaners must pass the "Grandma Test" - Would Grandma feel comfortable with this person in her house? We pick up the phone: Call our office at (203) 885-1094 during normal business hours and our friendly, courteous staff will be happy to help you. When we are not in our office, our office phones are forwarded to our cell phones so that we are always available to stay in touch with you! We look sharp: Our professional team of cleaners arrive on site in uniform. They are all trained, insured, and bonded! Competitive Pricing: By establishing "maintenance" routes we are able to meet our customers' needs, while keeping costs competitive.